Having the sharpest pictures always is a big advantage, and a sophisticated radio-astronomy technique using continent-wide and even intercontinental arrays of telescopes is yielding extremely valuable scientific results in a wide range of specialties. 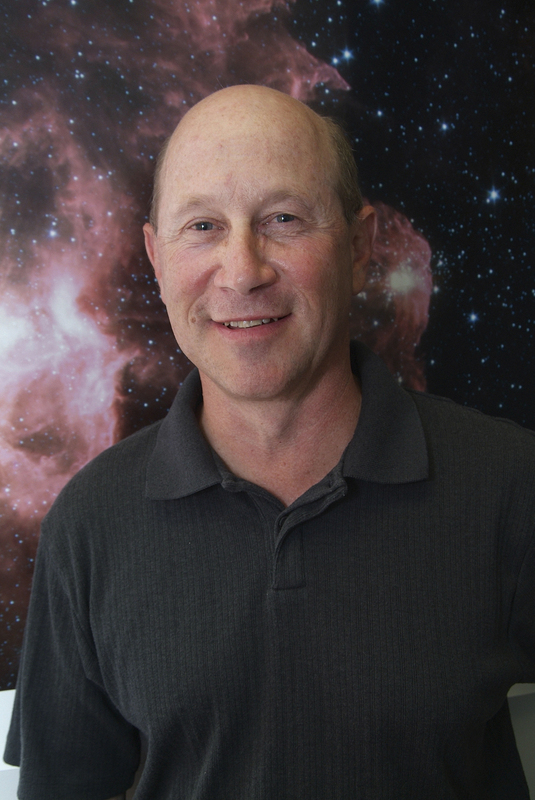 That's the message delivered to the American Astronomical Society's meeting in Austin, Texas, by Mark Reid of the Harvard-Smithsonian Center for Astrophysics, a leading researcher in the field of ultra-precise astronomical position measurements. Very Long Baseline Interferometry provides extremely high precision that can extend use of the parallax technique to many more celestial objects. Parallax is a direct means of measuring cosmic distances by detecting the slight shift in an object’s apparent position in the sky caused by Earth’s orbital motion. "Using radio telescopes, we are measuring distances and motions of celestial bodies with unprecedented accuracy. That's helping us better understand many processes ranging from star formation to the scale of the entire Universe," Reid said. The observing technique, called Very Long Baseline Interferometry (VLBI), was pioneered in 1967, but has come into continuous use only in the past 10-15 years. 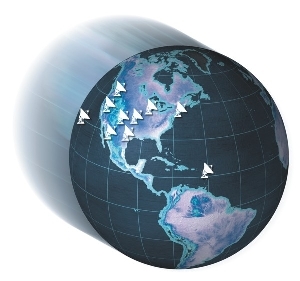 The National Science Foundation's Very Long Baseline Array (VLBA), a system of 10 radio-telescope antennas ranging from Hawaii to the Caribbean, was dedicated in 1993. There are other VLBI systems in Europe and Asia, and large radio telescopes around the world cooperate regularly to increase sensitivity. VLBI observations routinely produce images hundreds of times more detailed than those made at visible-light wavelengths by the Hubble Space Telescope. Several groups of researchers from across the globe use the VLBA to study stellar nurseries in our own Milky Way Galaxy and measure distances to regions where new stars are forming. The key has been to improve measurement accuracy to a factor of a hundred times better than that produced by the highly successful Hipparcos satellite. Using small clouds of gas in star-forming regions that strongly amplify radio waves, called cosmic masers, the astronomers measured the tiny shift in the object's position in the sky caused by the Earth's orbit around the sun. This, in turn, yielded highly-accurate distances by the simple surveying technique of triangulation, the "gold standard" of distance measuring techniques available to astronomers. "Knowing the distance accurately means we also know the luminosities, masses and ages of the young stars much more accurately, and that is vital to understanding how star formation works," Reid said. In addition, he pointed out, the VLBA observations have shown the motions of the young stars in the Milky Way are much more complicated than simple circular motion. Massive young stars appear to be born orbiting the Milky Way considerably slower than older stars. "This might be explained by the interaction of giant molecular clouds, the ultimate sites of massive star formation, as they "surf" spiral density waves in the Milky Way." An international team of scientists led by Reid has used VLBI to detect the slight change in apparent position of the object at the Milky Way's center caused by our Solar System's orbit around that center. "It takes our Solar System more than 200 million years to circle the center of our Galaxy, and yet we can detect that motion in only a couple weeks with the VLBA -- truly astounding!" Reid said. The VLBA studies of the Galactic Center have shown that an object called Sagittarius A* is at the exact gravitational center of our Galaxy. That means, the scientists say, that the object must be incredibly massive. "The VLBA measurements, combined with infrared observations of stellar orbits around this object, provide overwhelming evidence that it's a supermassive black hole," Reid explained. "These observations are also going to make it possible to re-define the coordinate system used to map the entire Galaxy," Reid added. Looking farther outward, astronomers achieved a longstanding goal of measuring the spin of another galaxy. In 2005, Reid and his colleagues measured both the rotational spin and the motion in space of the galaxy M33, nearly 2.4 million light-years from Earth. Astronomers in the 1920s had attempted such a feat, but their results were not accurate enough. "This achievement had to wait for the VLBA," Reid said. This and subsequent work has put strong limits on the amount of unseen "dark matter" around the giant Andromeda galaxy, which M33 orbits. A continuing goal is to use VLBI observations to measure the orbits of these and other galaxies within the Local Group of galaxies to which our own Milky Way belongs. The Very Long Baseline Array (VLBA), the National Radio Astronomy Observatory’s continent-wide radio-telescope system. 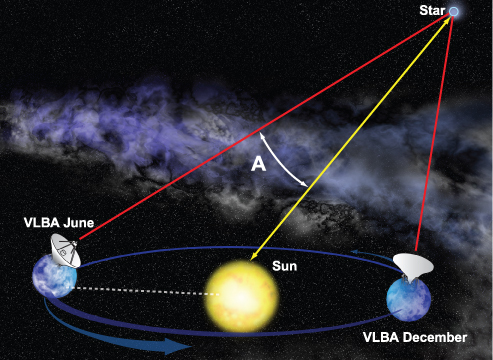 The VLBA provides the greatest resolving power, or ability to see detail, of any instrument in astronomy. In 1999, astronomers set a new standard for a distance measurement outside the Local Group of galaxies when they used the VLBA to make a direct geometric distance measurement to a galaxy called NGC 4258, 23.5 million light-years from Earth. That measurement, accurate to within 7 percent, caused other scientists to revise their indirect-measurement techniques for the rest of the Universe. The NGC 4258 distance was calculated by measuring the motion of masers in a disk of gas containing water molecules and orbiting a supermassive black hole at the galaxy's center. "Now, other galaxies are being observed in hopes of extending direct distance measurement even farther out in the Universe," Reid said. "One candidate, called UGC 3789, at a distance of about 160 million light-years, will be measured with about 10 percent accuracy. Our goal is to further improve these measurements and to measure 5 to 10 other galaxies in order to determine the Hubble constant (the expansion rate of the Universe) to 3 percent accuracy. This would put limits on key parameters of the dark energy that apparently is accelerating the expansion of the Universe," Reid added. The kind of accurate measurement of distances and motions that VLBI observations provide can benefit numerous other areas of astronomy, Reid pointed out. For example, the distances to pulsars have been measured directly with the VLBA, yielding better understanding of their characteristics. The technique also could reveal planets circling some nearby stars. "Anytime you can do something as dramatic as improving measurement accuracy by a hundredfold, you're bound to get a great scientific payoff," Reid said. "We're looking forward to exciting new results in the coming years," he added.